Obsessed with anything dragons, magic, and fantasy related? 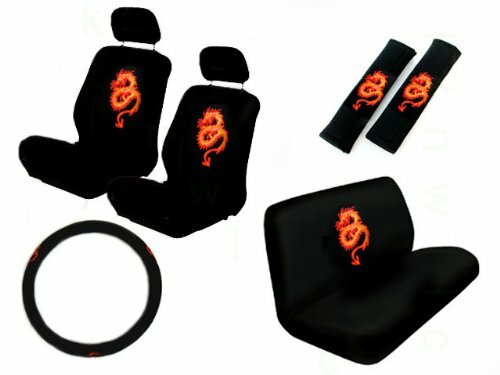 Bring the fierceness of the mythical dragons to your car with the Dragon Red Auto Interior Gift Set! The Dragon Red Auto Interior Gift Set includes 1 steering wheel cover, 2 bucket seat covers (2 top and 2 bottom), 1 bench seat cover (1 top and 1 bottom), and 2 seat belt shoulder pads. The simulated leather steering wheel cover provides a soft comfortable grip and fits most standard size steering wheels (14.5 - 15.5 inch.) The steering wheel cover also protects your steering wheel from cracking or peeling. The bucket seat covers are made from 100% Polyester material, and are designed to fit most high and low-backed bucket seats. It can be installed over or under the headrest on vehicles with removable headrests, and some vehicles with armrests may need to have them removed and reinstalled for a semi-custom fit. These front bucket seat covers come with elastic straps and hooks that will snug and secure it under the seat. * WILL NOT FIT SEATS WITH ANY OF THE FOLLOWING: 1. INTEGRATED SEAT BELT. 2. SEATS WITH SIDE AIRBAG. 3. OVERSIZED SEAT (captain seat). 4. SEATS WITH ARMREST (captain seat). The shoulder belt pads provide relief from the stress of the seat belts. Fill your car with the mystical and magical Dragon Red Auto Interior Gift Set today! **Note: The seat covers in this set will only fit cars that are passanger sized (compacts, coupes, sedans, etc.) The seat covers will not fit seats in SUVs or Trucks.